I made myself wait to do this review, because I didn’t want to inundate everyone right off the bat with my love for the McElroy Brothers, who you may remember from #DailyReviewChallenge2015 Day 2: My Brother My Brother and Me. Today I bring to you Things I Bought at Sheets from eldest McElroy brother Justin, and his friend Dwight Slappe. Yes, its another food review show, but it’s not like one you’ve ever seen before. The premise is simple – Justin eats a food and Dwight guesses if he likes it or not. It’s that simple, quick and over and done. Except not really. I recommend starting from the beginning, and bingeing the whole thing, which will take less than two hours. You won’t even get sick of the closing credits song, because it’s different almost every time! I have often said if I could only eat one food for the rest of my life, it would be breakfast burritos, because… well… have you had a breakfast burrito? They are basically the perfect food. But their perfection is in their variety – they can be small like the sausage burrito from Elephant’s Deli, grilled to perfection like the one at Meat Cheese Bread, or just bonkers ridiculous like the entire menu at Sams No. 3 (I would go back to Denver JUST FOR THESE BURRITOS). But that’s the thing, breakfast burritos can be many things. No two are alike. However, I’m not here to wax poetic on breakfast burritos. 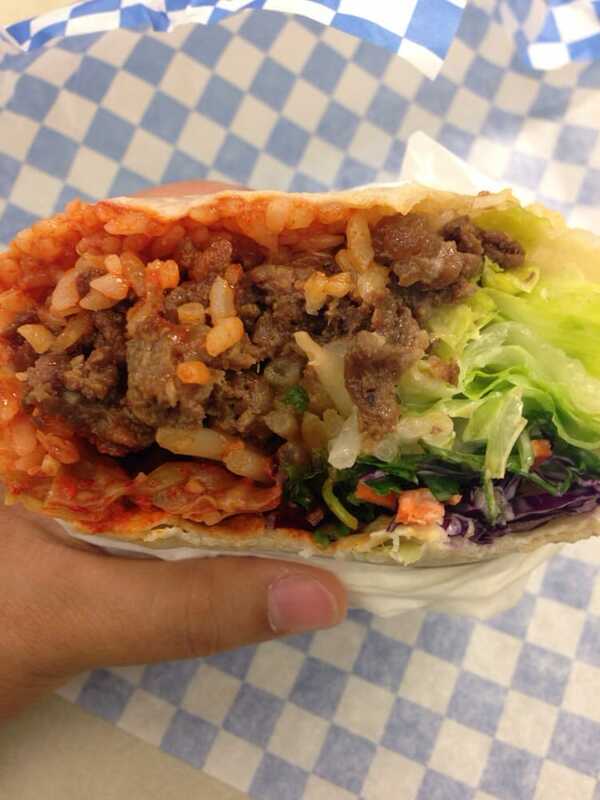 No, if I had to settle on one flavor for the rest of my life, it would be the Bulgogi Burrito at Korean Twist. These are not just your basic burrito. They contain: delicious, marinated bulgogi beef; fried rice with corn, edamame, peas and carrots; a mix of greens and cabbage; fresh cilantro; and a spicy orange “bbq” sauce that WILL stain your clothes. Then they wrap all that up in a tortilla, and you’re on your way TO FLAVOR TOWN! Another delightful perk of this cart is it has a covered seating area, so it’s worth the jaunt, even in the middle of winter. Which is great because the burrito is the perfect feel-good, rainy day food.